Malte Bruns was born 1984 in Bielefeld, Germany. He lives and works in Düsseldorf, Germany. Bruns obtained his MA in 2014 at the Kunstakademie Düsseldorf under professor Georg Herold who also granted him the Meisterschüler Academic Award. Bruns, whose work combines cinematic elements, photography, sculpture and architecture into an installation, is setting up his work in the area of 'New Media'. 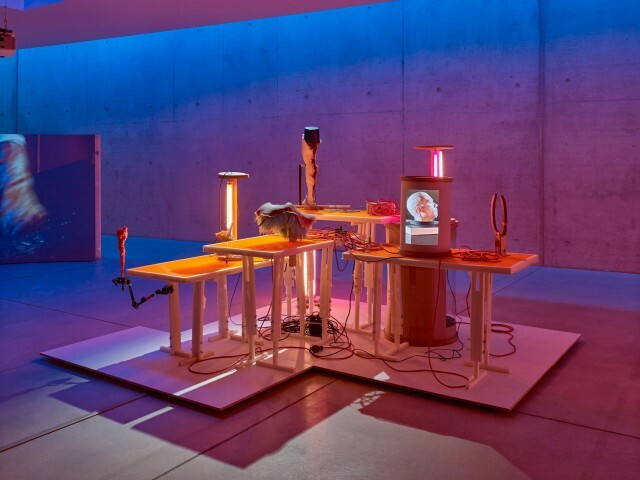 At a glance, the settings of the videos and photographs of the Düsseldorf artist seem to have emerged from the design laboratories of the old Hollywood. But his creatures do not undergo an active extension of the body by way of technological innovation. With their stoic, repetitive movements they emphasize that in their case technological innovation has already transitioned into a state of self-sufficiency, and beyond the human. Recent solo exhibitions include: 'Tremors', KIT, Düsseldorf, 2017; 'Talking to strangers', H'Art appendix, 2017; 'I've done... questionable things', Galerie Sturm, 2015. He has been included in recent group shows at 'Grim Tales', Cassina Projects, curated by ARTUNER (Eugenio Re Rebaudengo), New York, 2016; Galerie Lisa Kandlhofer, Vienna; Ampersand, Cologne; Düsseldorf Art Academy, Germany; KIT, Düsseldorf; and SSZ Süd, Cologne. He was a nominated and a Shortlist National winner of the Nam June Paik Award 2016.